Our 4-6 ton mechanical compact roller is typically designed to compact asphalt pavements, and it is widely used in highway, municipal work, country road, stadium and many other projects. 1. With hydraulic oscillation and vibration, it has great centrifugal power as well as compactness. 2. The 4-6 ton mechanical compact roller features compact structure, hydraulic steering, small turning radius, and flexible drive. 3. It is equipped with anticorrosive water spray system, 400L large water tank, and electric pressurized sprinkler. 4. Designed with shock absorber, this kind of 4-6 ton mechanical compact roller enjoys longer lifespan, and reliable and comfortable operation. 5. During its operation, it can stand nearby its targets. 6. Six-wheel trailer is also available. 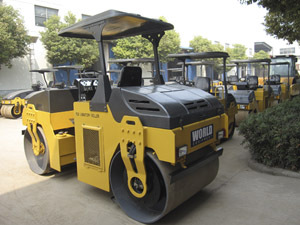 World Equipment is a professional manufacturer and supplier of mechanical compact roller in China. We offer 4 ton mechanical vibratory roller and 6 ton mechanical vibratory roller for your choice. Our products have been quite popular among customers from Europe, South America, Middle East, Southeast Asia and Africa, and more. Over the past 10 years, we have kept improving our products to make them better satisfy the market. If you need mechanical vibratory roller, we will provide a competitive price for you. Don't hesitate, please contact us.